Happy Monday Everyone! I saved the best rustic kitchen for the last post of the month. This kitchen just brings up feelings of comfort, peace, and home when I view it. The stove area is fantastic, set in the alcove which looks like it housed a fireplace. The white ceiling area tends to break up all the wood which is a nice touch. The area rugs draw in both the ceiling color as well as the wood. Great choice for the rugs. The lighter counter top color also gives the kitchen a lighter feeling than having the dark counter top of last week's kitchen. This kitchen has the Farmhouse sink style that last week's kitchen had. Very nice. There looks to be plenty of room on either side of the island to keep it functional, yet not in the way. I think I would probably do something different with the lighting, as well as the back splash for the stove. Happy Friday Everyone! I'm not much of a wine drinker, but I do have some friends who enjoy their wine. When I saw this, I thought of one of them in particular. Ah, laughter is great medicine. Hope you all have a great weekend. Try to get out of the kitchen, as warm as the weather is! I'm planning on making meatloaf in the cast iron skillet out on the bar-b-que grill! Have a good one! Camping Cooking Tips for You has some good tips. Several of the items most people probably already have. Like cast iron skillets. Love mine! He mentions tinfoil as a way to cook also. I realize a lot of people don't care for it, but I sure use it when camping with cooking! A great idea about bringing a spice kit along. I know when we first started camping, after we got home I would make a list about items I wanted to take the next time. Not a bad video overall. Let me know your thoughts! Happy Monday Everyone! 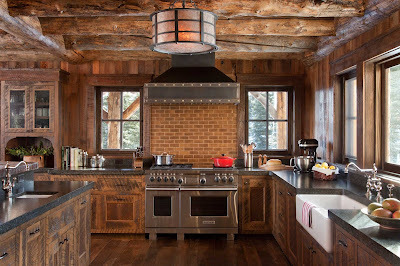 As I mentioned last week I have found some gorgeous Rustic Kitchens to finish out our month of July Klassy Kitchens. What a gorgeous kitchen this week! First of all, I love the stove, and the brick back splash just makes it! 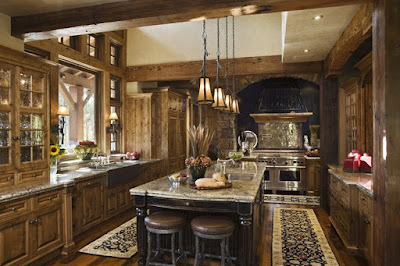 I also love the different shades of wood in this kitchen. The richer browns and reds work well together. Once again, the wood beams for the ceiling are a great touch. The counter space may be slightly limited, not sure how much we are not being able to view from this picture. The sink works very well with this style of kitchen also. I'm not a big fan of the range hood they have chosen. It does go well with the counter top, but it's not my favorite. 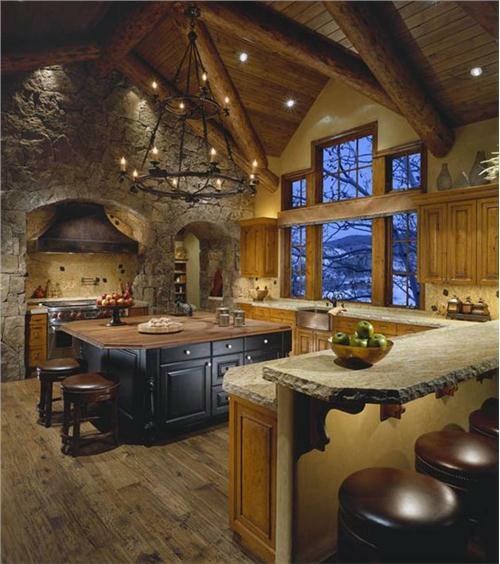 All in all, a lovely rustic kitchen. I do like the light as well. Let me know your thoughts. Happy Friday Everyone! Hope you have had a good week! I found a cute funny for today. For anyone who's ever owned a pet, I'm sure you can relate to this one some level. 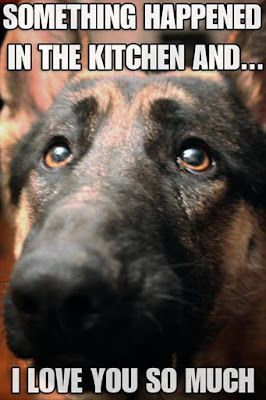 I went into the kitchen after carrying the groceries in, to put them away. On the floor was a bread wrapper without any bread in it, and it looked like it had been sliced open with a knife. My trusty pet was laying beside it with her tail wagging and her paw on the empty carcass of the bread wrapper. I am not sure exactly how quickly she wolfed down that loaf of bread, but it had to have been a record. Camping Cooking Bacon & Eggs in a Paper Bag. What an idea! I figured with summer and camping going on, I would post some tricks or hints for camping. I may have to try this, just to see how it works. It does make sense, but when we go camping we generally have skillets and such, but I have a couple of friends who love to go backpacking alone. This is something that might work great for that. Let me know your thoughts! Watermelon Has a Diverse History, Can Be Used in Many Ways in the Kitchen. When looking through news articles, so many are about the show "The Kitchen" and similar things and are not really news at all. However I found this article and was most certainly intrigued! 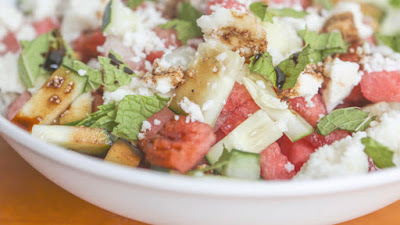 This article gives a little history about watermelon as well as some wonderful recipes to make using watermelon. My mom made watermelon rind jam one year, but that was the only time as her recipe was almost too sweet to eat! You can read the article yourself by clicking here. 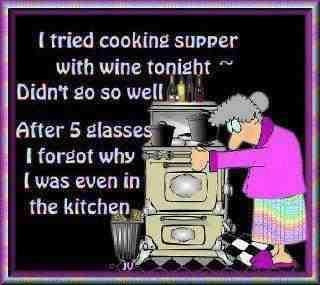 Happy Krazy Klassy Kitchen Monday folks! I was looking at some kitchens and found some that were titled as "Rustic". This caught my eye and I spent some serious time looking through the different kitchens. I'm not sure how these appeal to you all, but I love them. I'm a country girl and simple works real well for me, however, some of these are really "Klassy!" Let's take a look at the first one. I can just smell the hot chocolate and see the snow swirling outside of the beautiful kitchen. I love the stone are where the stove is inset. That is marvelous! There seems to be good counter space, and plenty of storage with the island. I like the accents of the wood beams in the ceiling, however, I'm not real fond of the lighting that they have in the kitchen. I would most certainly change that up. Let me know your thoughts.